If you're looking for a one-of-a-kind table, bar cart, or interior design item, we can probably create it for you. 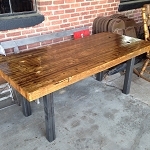 We have a huge selection of reclaimed wood, metals, and other interesting materials to work with. Contact us to get started.